When Tia Williams unearthed a rusty metal fragment during an excavation of a former Danish slave plantation in St. Croix this summer, she wasn't sure what she'd found. It was a 19th-century Danish West Indies coin—one of the key finds discovered during a four-week field expedition that gave a select group of Howard University undergraduates hands-on archaeology experience. "I was working some distance from the remains of the slave cabins, sifting by myself, when I found it," recalled Williams. "I didn't know it was a coin, but they were all excited. They told me it was really special." Williams seems to have a knack: She also found the remains of an 18th-century ceramic tobacco pipe that bore the mark of its Dutch manufacturer. Williams was one of four Howard students who were part of a unique multi-university expedition funded by the UC Office of the President's UC-HBCU Initiative, which is building partnerships with Historically Black Colleges and Universities (HBCUs). Organized by J. Cameron Monroe, associate professor of anthropology, the internship is part of a concerted effort to attract the "best and brightest" prospective graduate students to UC campuses, said Monroe. 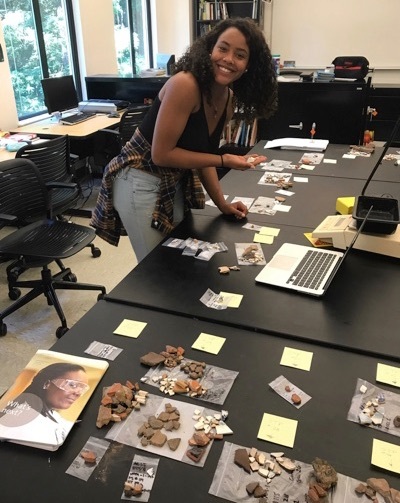 "UC really needs these students—they're bright, socially minded students who are interested in culturally relevant questions," said Monroe, who is involved with several programs focused on diversifying the field of archaeology. "They're going to go to graduate school at Harvard, Yale, Princeton—wherever they want. This is UC's opportunity to try to attract them here." Williams and her classmates spent four weeks in the field—two students spent two weeks in Haiti with Monroe before joining their classmates and UC President's Postdoctoral Fellow Justin Dunnavant in St. Croix. The internship included an additional week on campus, where they cataloged and analyzed some 2,000 artifacts they discovered. Each participant left UCSC with an ongoing research project they will pursue this fall. Led by Dunnavant, the St. Croix team was charged with doing a "survey" of the Little Princess Estate, which includes the remains of four slave cabins, to determine the density of artifacts. The well-preserved former sugar plantation is now a cultural heritage site managed by the Nature Conservancy; all artifacts will be returned after analysis. Archaeologists are able to glean incredible insights from bits of pottery, bone, and even seeds that can reveal dietary clues, and Monroe and Dunnavant were pleased by what the sites revealed. For her part, Williams expressed relief that the hours of grueling work in the hot Caribbean sun had yielded some valuable discoveries. The St. Croix team first had to clear the land, wielding machetes to remove trees and brush from the site, which is about 2.5 acres in total. 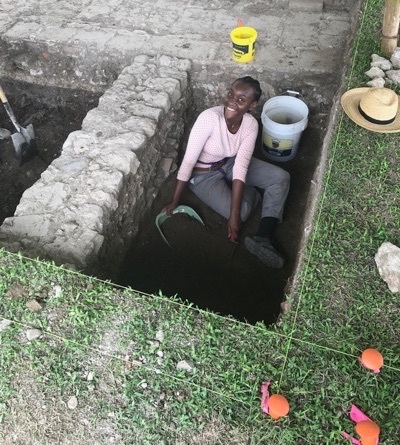 Jewell Humphrey, an Africana studies major at Howard University, described spending seven hours a day in excavation pits, shoveling dirt, revealing layers, sampling soils, and sifting dirt in search of archaeological treasures. Back in the lab, analysis and cataloging involves counting and sorting the bits of bone, pottery, glass, buttons—and the prized coin. "It was all really interesting," recalled Humphrey, sitting in a UCSC lab surrounded by plastic bags filled with artifacts. Archaeology allows researchers to ask different questions, and it can give voice to those who didn't have access to the historical record, said Dunnavant, the lead researcher on the St. Croix site. "The written history of this plantation was written by slave owners," he said. The UCSC-led team also worked with members of the local Caribbean Center for Boys and Girls, which is training youth aged 12-18 in archaeological field work, and the University of the Virgin Islands. They were twice featured in on-air interviews with the local radio station, and they attended cultural events, including the island's Emancipation Day celebrations on July 3. They even got a chance to snorkel and scuba dive to introduce them to the skills needed for underwater archaeology. Dunnavant, a certified diver, is a founding member of the Society of Black Archaeologists and part of the Slave Wrecks Project led by the Smithsonian Institution and George Washington University. "The Caribbean gets a lot of hurricanes, so sand is always moving, uncovering and revealing wrecks," he noted. At the end of their week at UC Santa Cruz, the four participating students presented their work and outlined the projects they will pursue this fall. "Their presentations were outstanding," said Monroe. "They were doing first-year graduate level data analysis." For her part, Humphrey will use the results of this summer's survey to do the initial mapping of artifacts; higher concentrations of artifacts suggests areas of greater daily activity, explained Monroe. "So the team will use those maps next year to determine where they actually dig," he added. Ultimately, the five-year survey will allow researchers to map the entire site in detail, using the location of artifacts to identify cooking areas, trash pits, toilets, and more. Tia Williams, an aspiring landscape architect, wants to design a walking "heritage tour" of Monroe's research site in Haiti. Tourists are fascinated by the remains of the early 19th century palace, but they lack a systematic way to access information about the site's rich history. Different historic trails would fill that void, and Williams plans to also design a small museum for the palace basement. "She actually has a chance to get this thing picked up by the Haitian government," said Monroe, who will remain engaged with each student's project. The Office of the President has renewed funding for the internship for three more years as a Graduate Pathways Grant, and Monroe expressed satisfaction that the program appears to be working: two students from this year's cohort appeared interested in applying to graduate programs at UC Santa Cruz, and another expressed interest in UC Berkeley. "They had a great time, and we did a good job," said Monroe. "For faculty, the incentive is to attract these bright students. For the university, the incentive is to encourage them to apply to a UC campus. But ultimately, we're helping these students launch their careers. When they apply to graduate school, they're going to get in all over the place. I can't wait to see them with their PhDs teaching at universities all around the country."